In this show, Sigler brings a meditative, realistic still life aesthetic, a painterly eye and attention to objects both mundane and ceremonial. Shiny sterling silver vessels and heirlooms hang happily alongside lovingly fastidious paintings of a desk fan, an espresso pot and a vintage telephone, looking gracefully iconic in this setting. Some of the more “precious” objects and heirlooms are presented in triptychs and other multiple panel contexts, giving works like “Revival” and “Family of Heirlooms” the character of personality-endowed object worship and transformation into art. From the evidence here, Sigler has a real gift, as a painter and thinker about how painting functions. I couldn’t agree more. 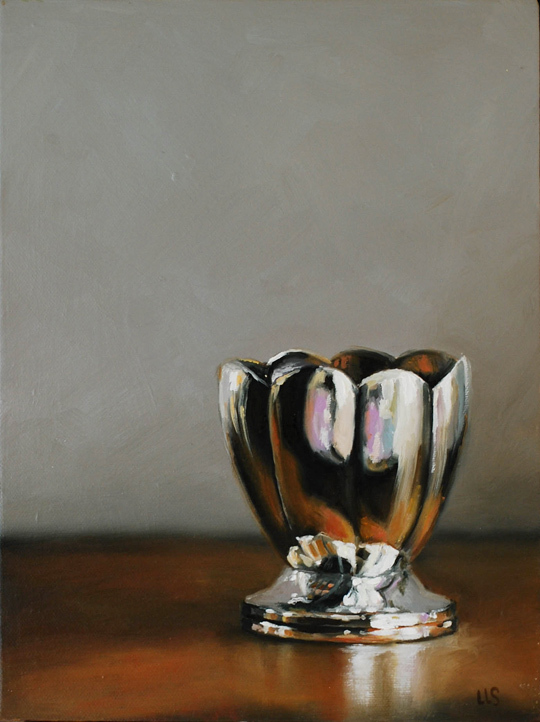 One of my favorite of her most recent paintings, Hand-Me-Downs (below), is a rare example of an image that captures the silent beauty of a still life, while at the same time allowing the viewer to understand an open-ended narrative that gives the painting staying-power. These are works with which you can live; they subtly maintain your interest, remaining beautiful because they always have something new to say. 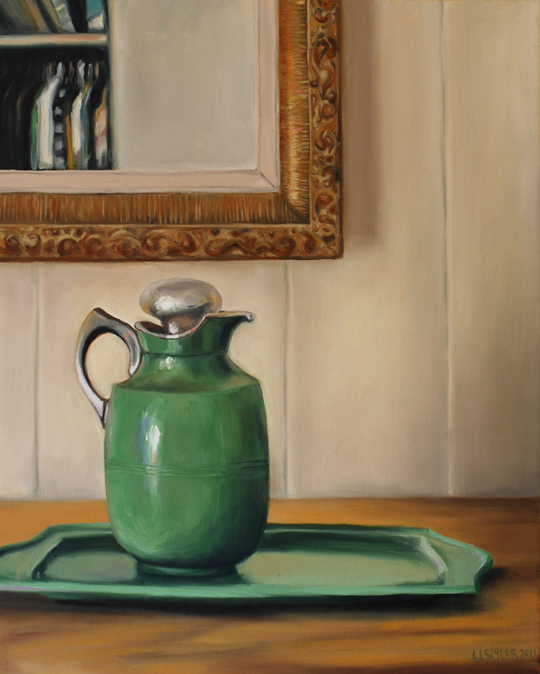 Another of my favorite pieces, Scalloped Creamer, was recently part of Atkinson Gallery‘s Small Images show. Again, Leslie is able to take a still life and make it something more. It is beautiful, but it is also a cold, hard object yearning for warmth and life that it can only reflect. I’m looking forward to following this series as it continues to grow, quietly telling a library of stories with a vocabulary of polished surfaces and discreet compositions. This entry was posted in Art Friends, Events, From the World on November 2, 2011 by ellenheck.